Have you had the chips that are made out of veggies? I quite like them. 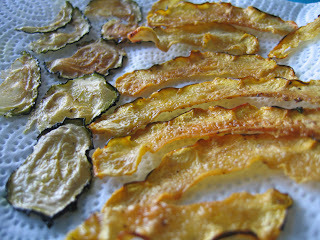 The other day I decided to try to make some of these 'veggie chips' at home. Now, I know those chips you buy in the store and to just veggies, there lots of chemicals and other odd ingredients. 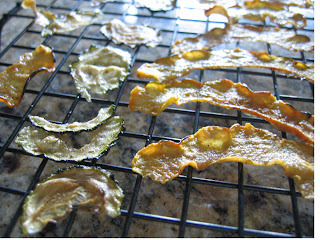 But to make a basic potato chip you just need a thinly sliced potato and hot oil or a good oven. Why not be able to do the same with a zucchini or a beet? You can, but it's not exactly what you want it to be. Of course, I refuse to deep fry anything so I'm left with only baking these chips, so they could turn out more chip like if you actually fried them, but that would defeat the purpose to using vegetables in the first place. My attempt was to slice a zucchini and a squash (acorn) real thin, toss with a little olive oil, salt and pepper and then simple bake them. First I tried to bake them on high; which resulted in a batch of nearly burnt yet also soggy chips. Second batch I turned the oven down to 200 degrees and let them dry out. This took about 2 hours. While I found the chips much more uniformly cooked I just felt it too so long for a little batch of chips. Not to mention how tiny the chips got; the size of a quarter and penny most of the time. All in all, I won't rush to make these again. When I do, I'll change it up a bit; try some beets and maybe a different process. But this is what it's all about. If you find something you like, try to recreate it. Sometimes it works and sometimes it doesn't; you just don't know what might happen! Plus, eating your mistakes is not all that bad!! Preheat the oven to 200 degrees. Slice the zucchini and squash extremely thin. If you have a mandolin - use it; if not, just take your time, use a sharp knife and slice slowly. Toss the slices in a bowl with a drizzle of olive oil, salt and fresh ground black pepper. Lay the slices in single layer on a baking sheet (or two) and place in the oven. Bake until crispy- this could take up to 2 hours - have patience!